Bluegrass Horse Feeds, Ashley Neely BSc, SQP gives us some handy tips to controlling our horses weight this summer. Our horses body weight naturally fluctuates with seasonal changes, as we approach the summer months the higher quality forage means a higher calorie intake and this often leads to weight gain. An extra scoop of hard feed, an apple or treat, all add up when it comes to our horses that struggle to keep weight off during the summer months. Research has shown that size is not an influencing factor but in fact it is breed. One study showed that cobs are 13 times more likely to be obese than lightweight breeds such as thoroughbreds. Obesity in horses can lead to serious health complications such as exercise intolerance, insulin resistance, laminitis, equine metabolic syndrome as well as placing severe strain on joints resulting in lameness. Insulin sensitivity has recently been correlated with overweight and obese horses and ponies, as body fat mass increases insulin sensitivity has been recorded to reduce, there are however other contributing factors to this condition such as genetic and environmental influences. Portable weigh bridges, weight tapes and condition scoring are ways in which we can easily monitor our horses weight and condition. Henneke et al, in 1983 developed the nine-point condition score. One being emaciated and nine being extremely obese, ideally, we want our horses to be a five, dependant on their performance and breeding status. During grazing season, it can be a challenge to keep horses and ponies that are prone to weight gain under control. Restrictive grazing methods such as strip grazing, or the use of grazing muzzles can be affective. Restricting grazing for several hours a day however, has shown to have little to no affect and can lead to bigger issues, with horses consuming almost as much grass in a few hours compared to if they where continually grazing. When obesity or other health issues are a high risk, total removal from grass may be required. Replacing grass with hay will decrease the calorie intake and allow strict monitoring of the amount being consumed. Soaking the hay for 10 minutes in cold water will remove some water-soluble carbohydrates, it is recommended that the hay is weighted carefully to provide only 1.5% of the targeted body weight per day. Feeding a low-calorie feed or balancer such as the Bluegrass Stamm 30, will provide the key vitamins and minerals required for a balanced diet whilst preventing any additional weight gain. For those prone to conditions such as laminitis, Stamm 30 is an ideal feed to provide the essential nutrients to promote health and repair of the laminae and control inflammation. 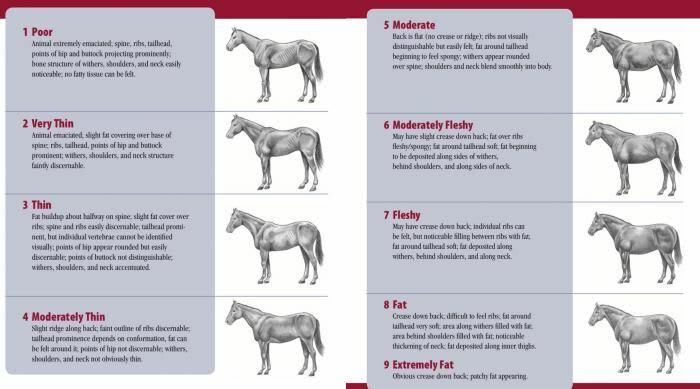 It is important as horse owners that we have the knowledge on how to assess our horses weight correctly to help maintain an appropriate condition score and prevent associated health issues from occurring.